It’s that time of year where I post another ridiculously huge birthday haul! Like last year I bought a few random things but decided to spend the vast majority on fabrics and costume supplies. My birthday was a couple weeks ago, and the day before it my dad and I went shopping in the NYC garment district where all of these lovely things came from! I know not everyone likes hauls, but I got a positive response when I did this last year so I decided to bring it back! If you don’t care for this type of post, i’ll have a “The Making of” post up on Monday which might be more to your taste. If you do like hauls, i’ve done two before, which can be read here and here. Lets start with one of the less exciting cuts of fabric, and we can build up to the really good stuff. 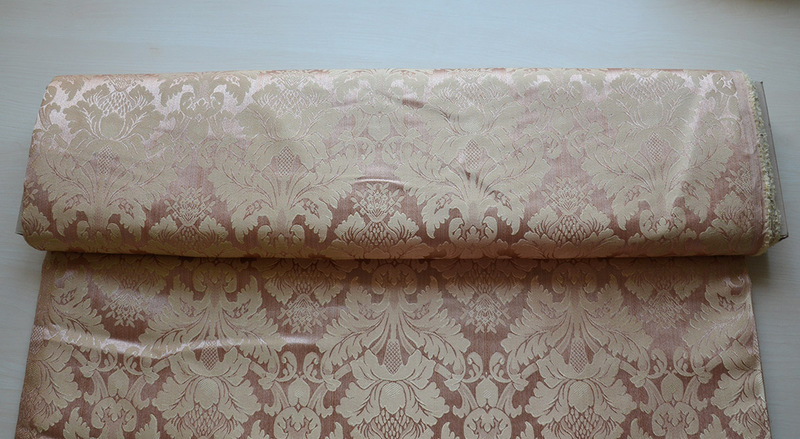 This is 120″ wide home decor weight damask. One of my favorite stores in the garment district (Zahra Fabric) has started stocking this whole collection and sells them for ten dollars a yard, which is pretty damn good considering the weight and width of this fabric. This is actually the exact same fabric I used for my Dewdrop Dresses, just in a different color! I plan on using this for a medieval style dress and headpiece, similar to what is shown here and here. Funnily enough, I spent several minutes between debating between this fabric and another in a red color scheme. I finally decided on the orange/gold material because I have so many red dresses in my portfolio already and none in this shade. It wasn’t until I got home that I realized it’s very similar to the fabric i’m using for my tudor project. From the same store I got two yards of brown velvet. These are for the sleeves of my tudor project. A lot of the fabric I originally purchased (about three yards) was damaged and had to be discarded. I didn’t have enough fabric leftover to make the sleeves and was unable to buy more of the original fabric. Velvet was commonly used for sleeves and I think the warm brown color goes well with the orange/gold I used for everything else! 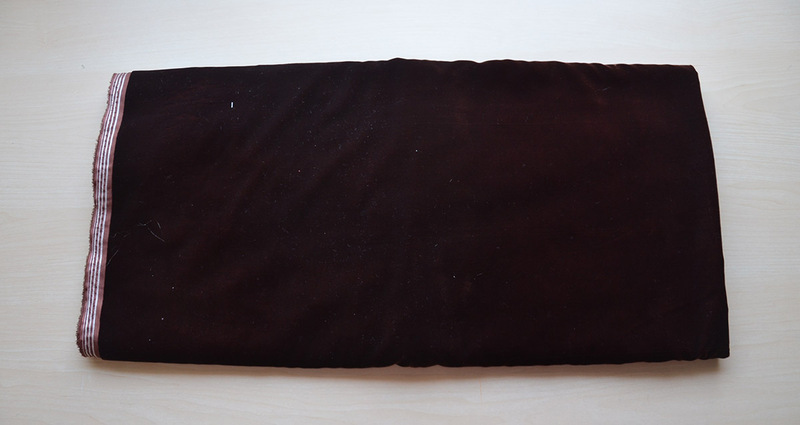 Speaking of velvet, I bought a lot of it! The red velvet is for another 16th century project, based off of this painting. 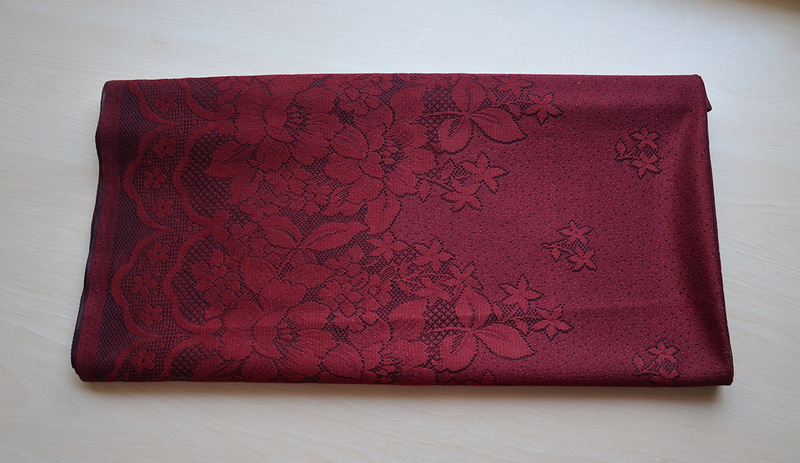 Unfortunately my streak of buying damaged fabric continues with this red velvet. The first few yards were damaged from the machine that bolted it, so I got those for free. But I didn’t realize the damage continues down the entire length of fabric. So that is annoying and will be troublesome to work around. The black velvet is for a design which might end up being part of my Monarch [butterfly] Collection. I haven’t mentioned that series much on this blog because I haven’t actually finished any of the projects relating to it. I have about five WIPs in this series and instead of focusing on those i’m buying fabric for a new one. Oops. 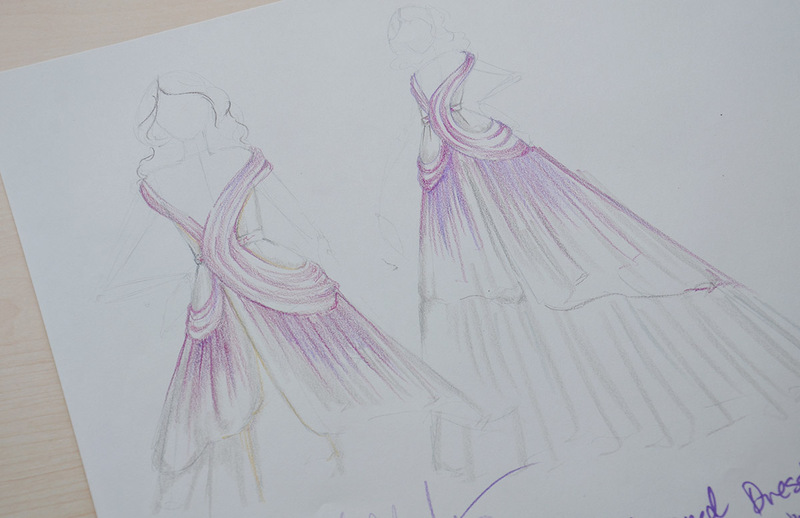 This is the rough design for the dress I’d like to use it for. The next few pieces of fabric were bought for an Orchid inspired dress. I have four orchids now, they sit next to my desk and I love seeing them everyday. I get really inspired by things around me, so it was only a matter of time until I took inspiration from them! This is the original sketch but I’ve made some design changes since sketching this. 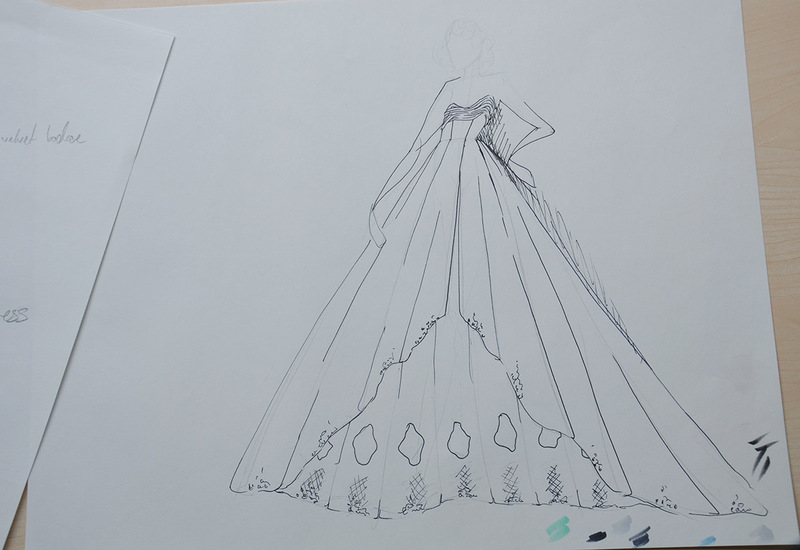 The actual dress will have a similar shape and bodice design, but it will look much different. I bought more of the 120″ wide home decor fabric for this project. This time I went for a simpler pattern which is made up of alternating off white stripes. 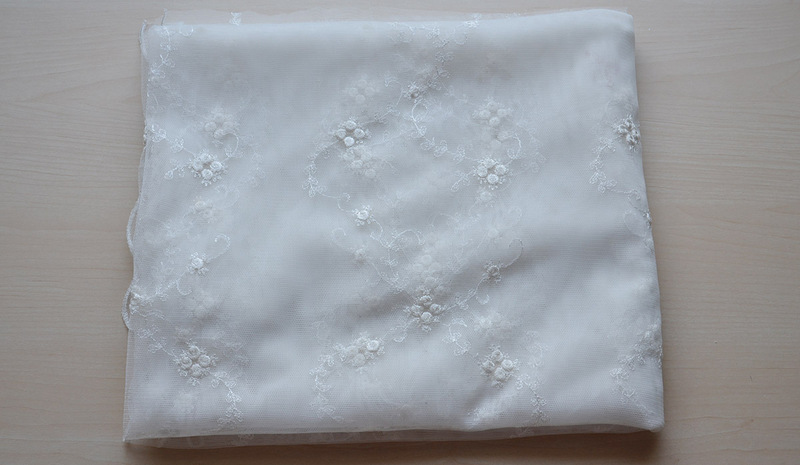 I also got four yards of off white silk organza to use for the bodice and trims. I don’t usually shell out the extra money for silks but I got a good deal on this one (four yards for thirty dollars) and really like that it is matte. 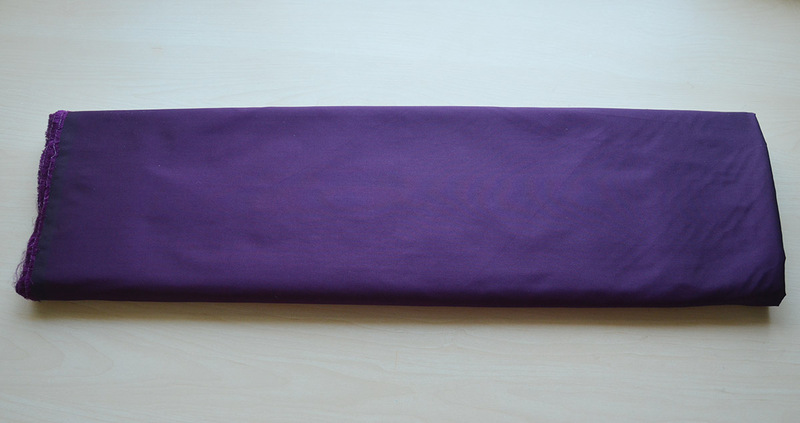 For the purple parts of the dress I bought four yards of silk taffeta. I found a few gorgeous two toned taffetas, which were very tempting, but I ended up going with this one because it has a beautiful weight and texture to it. I was playing around with it in the store and I knew I could drape and sculpt it into the exact shapes I wanted. 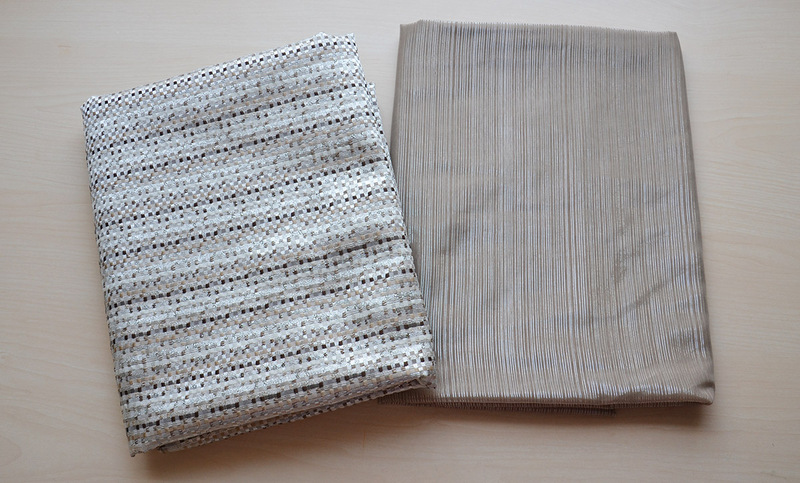 Both of the silk fabrics I bought were from Amin Fabrics. I didn’t even know they sold silks until this trip, but i’m not surprised, that store has everything which is why it’s one of my favorites! Another one of my favorites is Hamed Fabrics, but I only got six yards of fabric from them. Two of those yards can be seen on the left. It’s a woven fabric made up of many neutral colors with metallic ribbons weaving through it. 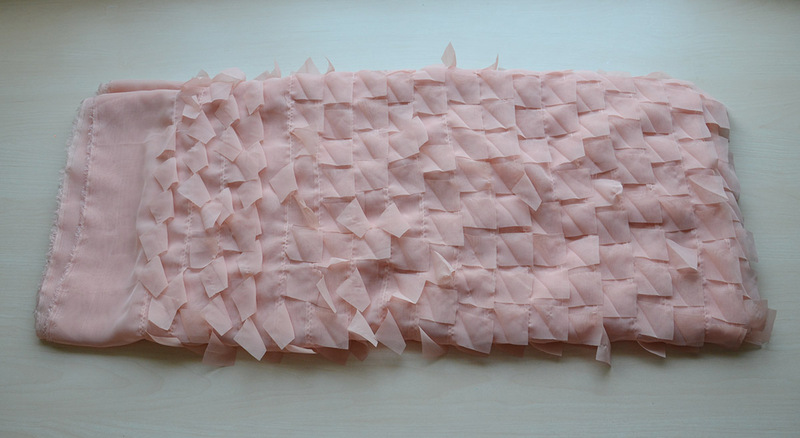 Not the type of fabric I would usually reach for, but I thought it was really interesting! I’d like to work this into a menswear inspired ensemble if I can, and maybe pair it with some black wool i’ve had for a while. 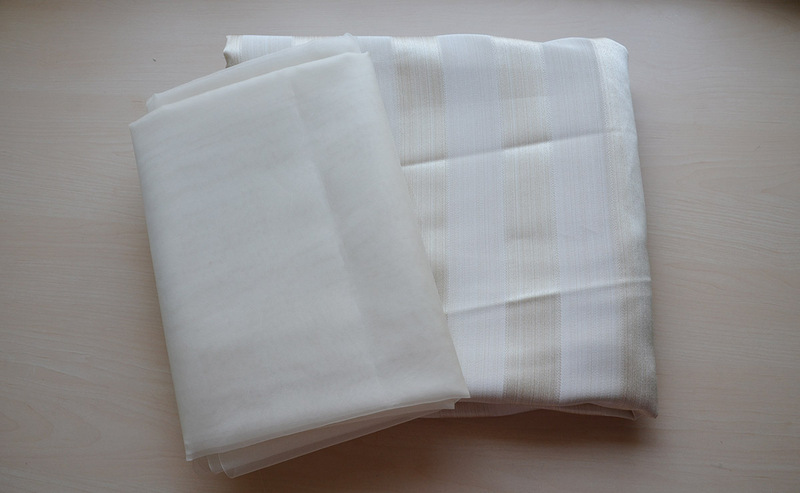 The fabric on the right is from Cut Fabrics Inc. It’s a beige chiffon (with stiffness to it which makes it almost resemble organza) with silver stripes. They had this in lots of colors and I regret not getting more. I think this would make really nice puffs for underneath paned sleeves. 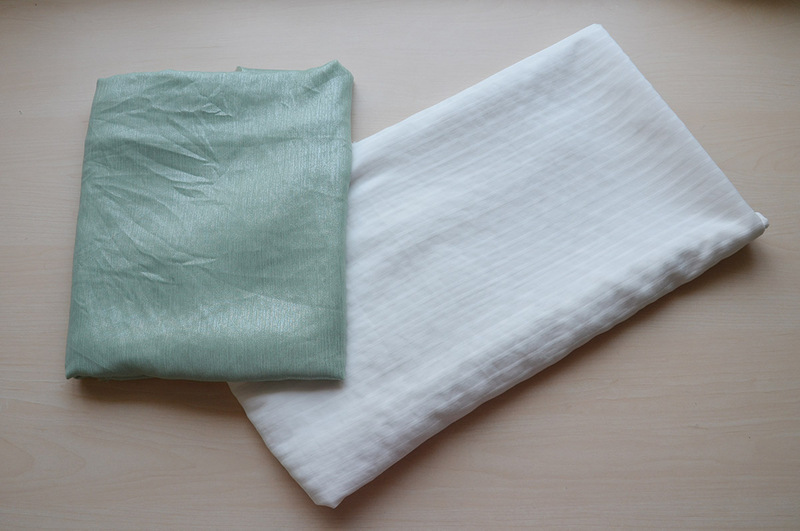 Also from Hamed Fabrics I got a green chiffon with silver woven through it. Again I probably should have gotten more of this, I think I got three or four yards, which isn’t enough to make a full dress. This is what happens when you don’t have a list! I got this to make some type of fairy inspired dress. I purchased an interesting string of beads at Beads World in the same color, which I plan to turn into a crown. I’d like to use this fabric to make a dress that matches it, but I have no clue what it will end up looking like. I also got a few yards of a lightweight striped cotton. I’ll probably use this to make a smock or chemise to wear under something. Not the most exciting purchase but basics are important too! The next few fabrics are from a store I usually avoid. It’s called “Day to Day” and tends to have higher prices than I’d like to pay. This week they had a big “everything must go” moving sale (but they may have been using that as a ploy to get people in – one store has had a sign like that up for three years) so I went in. I think of this store stocking exclusively home decor fabrics but they had tons of lace too. 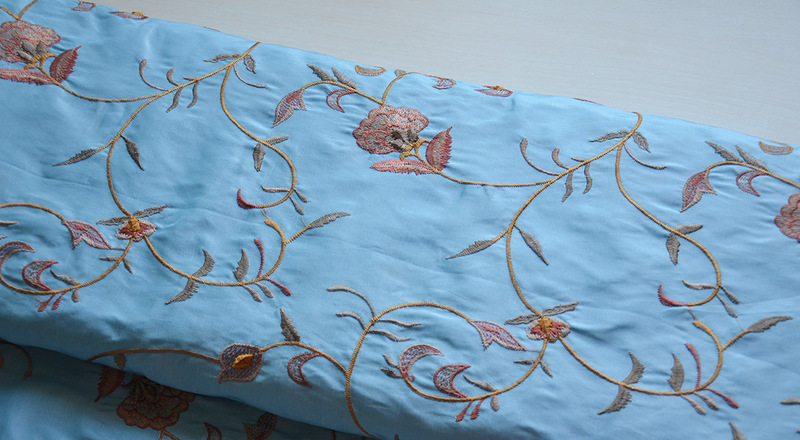 The “home decor” fabric I got is a pale blue taffeta with an embroidered floral design. I’ve seen versions of this fabric in Joanns with red/gold color combinations and never been fond of it. But I love this color and I think it will eventually be turned into a gorgeous 18th century ensemble! In the same store I got some white embroidered mesh. On my last trip into NYC I got taffeta and glass stones to use for a 17th century gown. That dress will let bits of the chemise showing at the sleeves and neckline, so I bought this with that in mind! 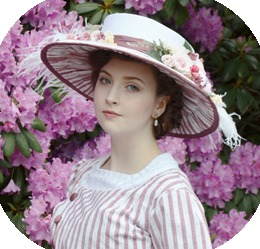 Not historically accurate, but it’s so pretty and will look much nicer than linen. The last thing I got from that store is a gorgeous piece of pink lace. I wish I had gotten this in another color too, but I didn’t have any reason to. 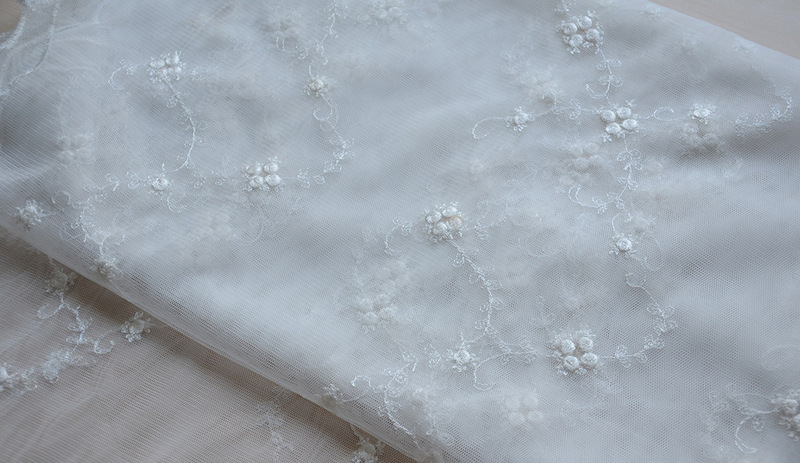 This lace was marked at $145 a yard. After twenty minutes of haggling I managed to get it for forty dollars! Which is still a a lot for a single yard of fabric, but the detail of this fabric is incredible and I think it was worth every penny. I don’t have a project in mind for this but i’m sure i’ll figure something out! The final two pieces of fabric are for another original design. This one is a little weird. It was actually inspired by a vulture. 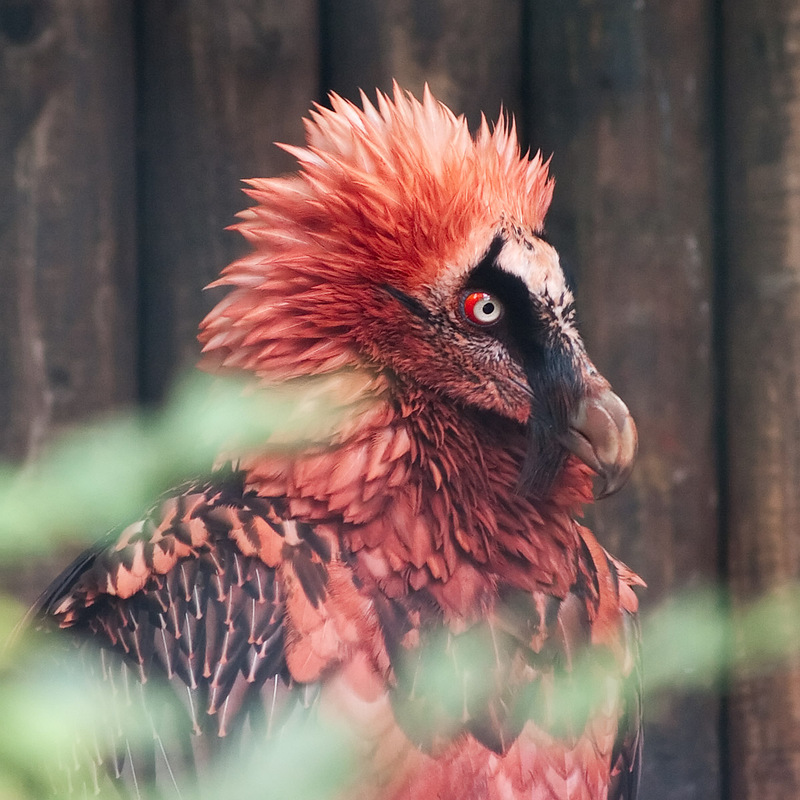 They are called Bearded Vultures and their diet consists almost entirely of bones. They are mostly cream colored and grey but can develop richly colored plumage from rubbing dust and mud on themselves. And when they do, it’s gorgeous. The coloration they have in that state, and the amount of texture their feathers have were the inspiration for this piece. I don’t have a good idea of what this costume will look like just yet. I’ve done a few sketches but I don’t feel ready to share them. I think it’ll be a fitted gown but i’m still debating. However this idea was cemented in my mind so much that I bought a few fabrics for it! 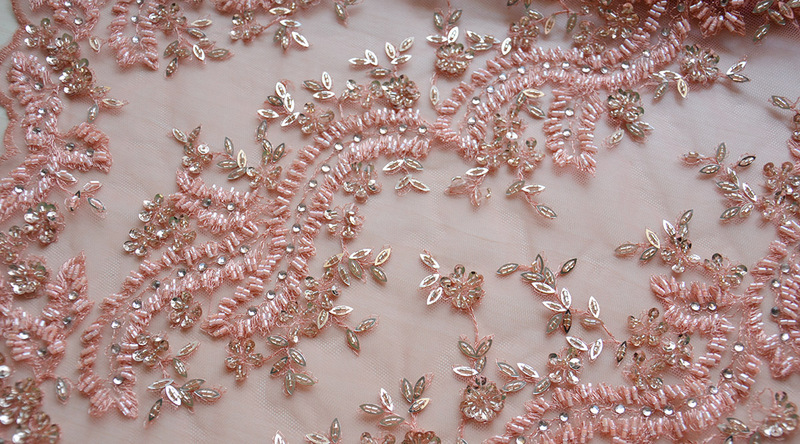 The first is this peach colored laser cut chiffon. It’s so fluffy. The other is a piece of tablecloth lace. It’s woven from red and black threads so it has a very interesting color and sheen to it. The color is what made me want it, but I really like the lace pattern too. And as a bonus, it was super cheap! Like, five dollars a yard cheap which is a steal when it comes to lace. And that’s it for fabric! I’m happy with what I got but the in store selections weren’t that great this time. Usually I have problems restraining myself in certain stores because I like everything and could easily drop two hundred dollars in them. That didn’t happen at all this time. Which makes me think the selections are better in the winter, because around Christmas I saw sooo many fabrics that I fell in love with. Anyway! Onward to trims and beads! I went back to Beads World. 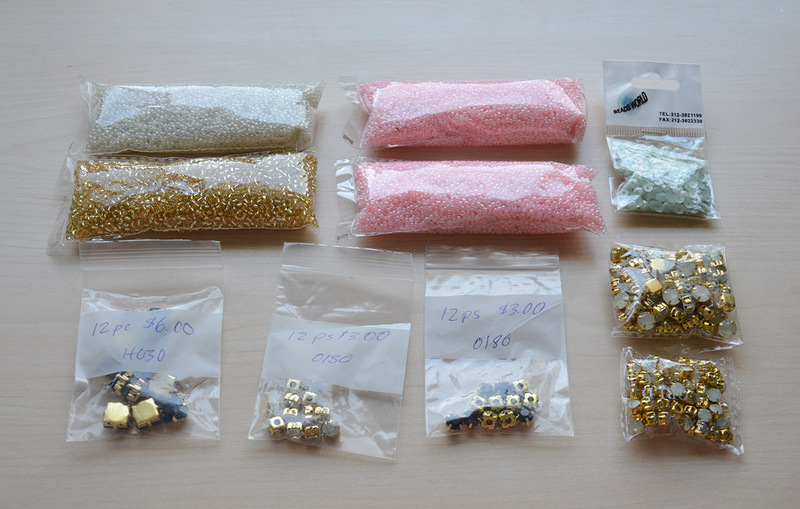 This time I got seed beads for my 18th century dress. 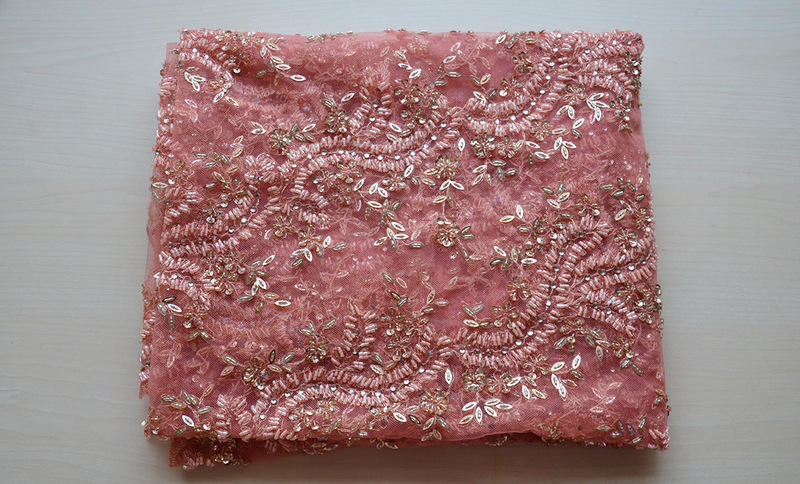 It has lace on the hem which I plan on beading by hand, so that is what the pink and off white ones are for. 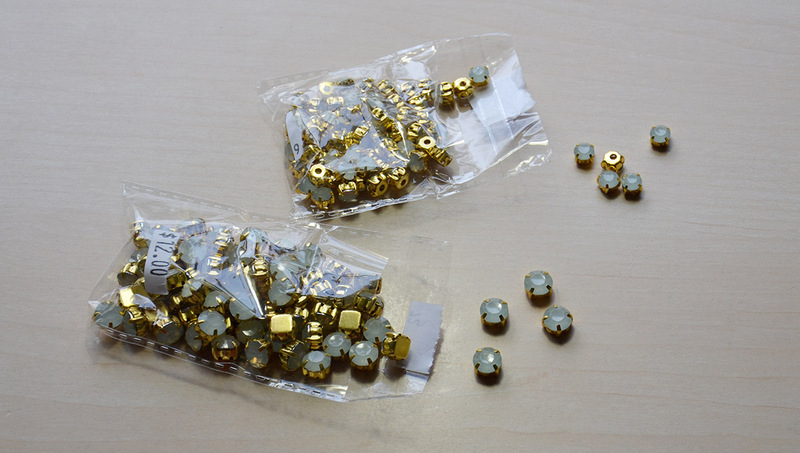 The gold ones are because I wanted more gold beads, even though I didn’t really need them. I also got a dozen clear glass montees for my tudor project (I ran out). And two dozen black montees for another tudor project. This time i’m going to be more historically accurate, which means using stones that imitate things they were actually capable of using at that time..
Oh and I got a small bag of green sequins for the previously mentioned fairy inspired dress. Because it will probably end up being sparkly. Most of my projects do. I had a few impulse purchases in beads world, too. I got two bags of green montees which are imitation opal. I believe these are trying to imitate “Ethiopian Welo Opal”, but i’m more familiar with them being called “Fire opal” or “White Dragon’s breath” because I spend to much time on etsy and those are the names indie jewelry companies use! Either way, they are gorgeous in a way my camera couldn’t capture. They have a milky green base with lots of flecks in them that shine white, pink, blue, and gold. I’m not sure what they will be used for, but i’m excited to use them! The last Beads World purchase is the weird strand of beads which i’m going to make into a crown. To me, these look like something you would see in the ocean. But i’m pretty sure they are plastic and dipped in metallic paint. For my purposes, that doesn’t really matter. They are going to make the most gorgeous fairy princess crown. I ended up going into yet another bead store. I couldn’t find the name of it online, but they were selling montees for half the price Beads World does! I wasn’t expecting to find these there, otherwise I probably would have gotten more. I’d never seen them in this store before, so i’m not sure if they will be there permanently. I got a bag of large red ones, teardrop shaped brown ones, and two packs of small blue ones. 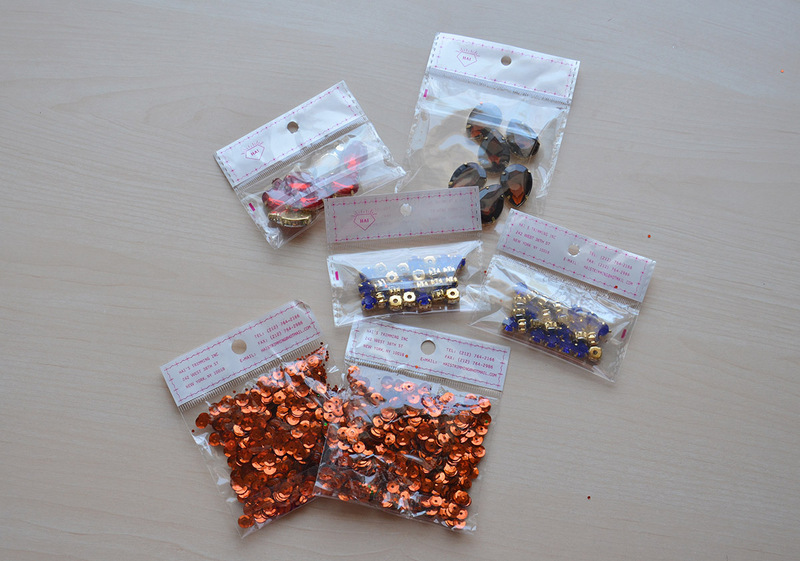 I also got two bags of orange sequins for the black velvet butterfly inspired dress! At a random trim store ( I couldn’t find the name online) I bought a yard of alencon lace. This is for a wedding dress idea i’ve had for ages. I have enough lace for the bodice, but not enough to trim the sleeves with. 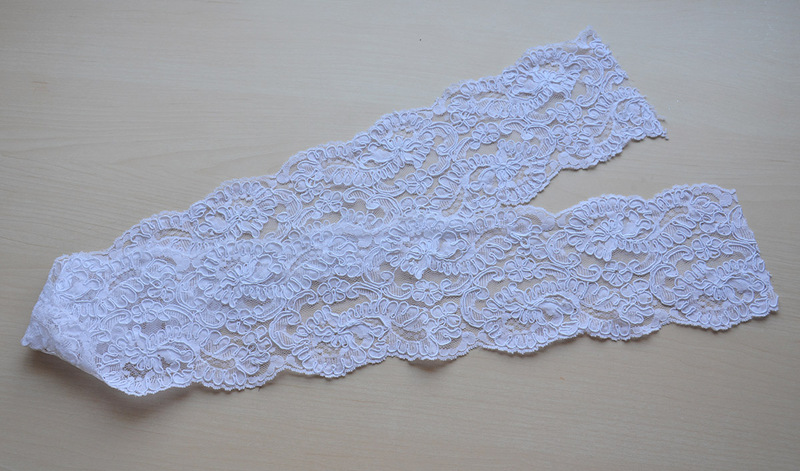 This lace is similar in design and should work for that purpose! In the same store I got two yards of an embroidered lace trim. 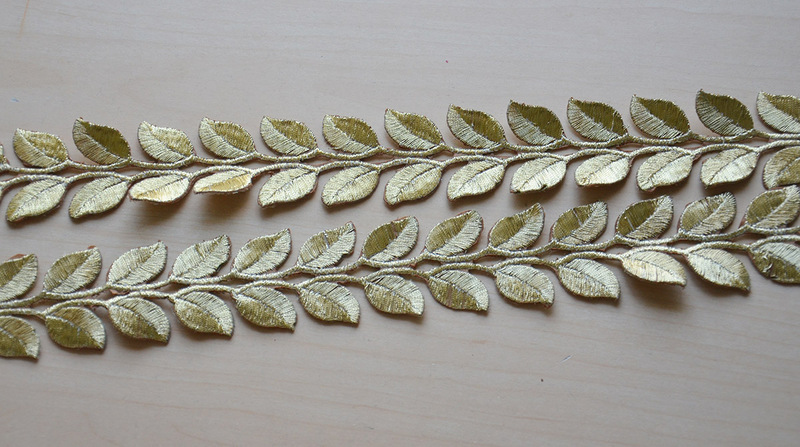 I’m not sure what this will be used for, but it would look nice on the bodice of a dress. I could also see it running down a set of sleeves! 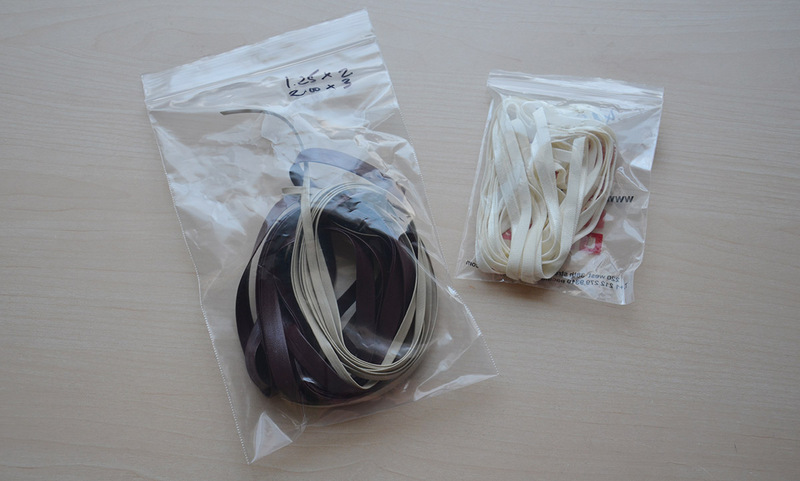 I bought some leather “bias tape” – it’s actually small strips of thin pleather with the edges turned over, similar to singe fold bias tape, but I don’t think it would go around curves very well! I got this with my vulture dress in mind, for trimming the edges of bodice panels. At Pacific Trims I got four yards of ribbon elastic. I’ll use this for gathering sections in sleeves, which will create delicate little “puffs” I have a Renaissance project coming up that I need this for. 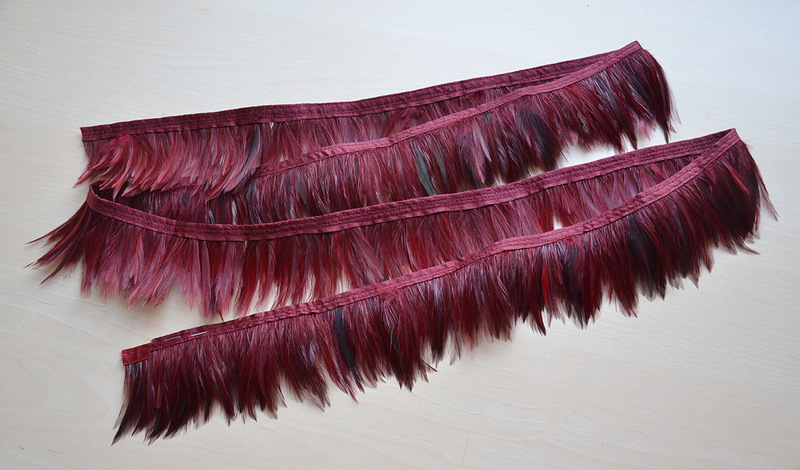 Also at pacific trim, I got some fake fur trim. I think this was six or seven dollars a yard, which is kind of ridiculous when you can buy a full yard of sixty inch wide fake fur for $12 at Joanns. But fake fur is miserable to work with, and I don’t want to put myself through that. I’d rather make fifty yards of bias tape from chiffon. Yeah. That’s how much I hate working with fake fur. Plus this is really nice! 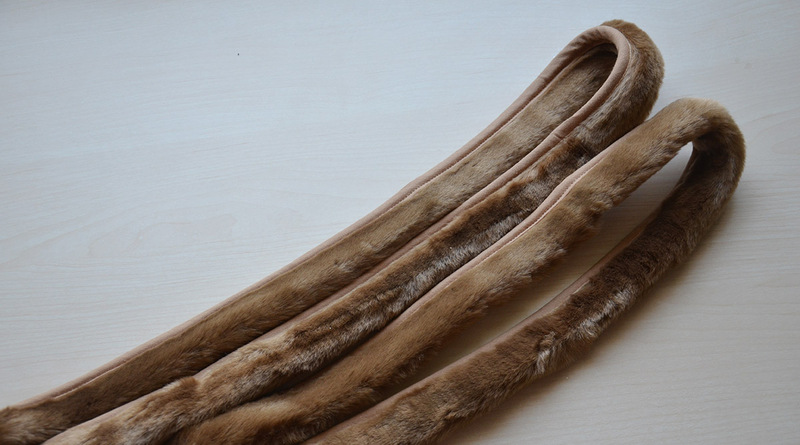 It doesn’t have the typical fake fur sheen, and it isn’t super thick. It is already attached to strips of cotton and the perfect width for trimming sleeves! This will be used for the medieval style dress I linked photos of earlier, and i’ll pair it with the orange and gold damask. The final two trims I got are from M&J trims. I usually don’t go into that store since it’s a bit overpriced and the employees are very…attentive? But not in a very positive way. In a way that makes me feel guilty for browsing. But they have a fantastic selection and I knew they would have what I wanted, so I went in. I got exactly what I needed and was out in five minutes – yay! All I needed were feathers, which they have a pretty great selection of. I got a yard of peach colored goose feathers. 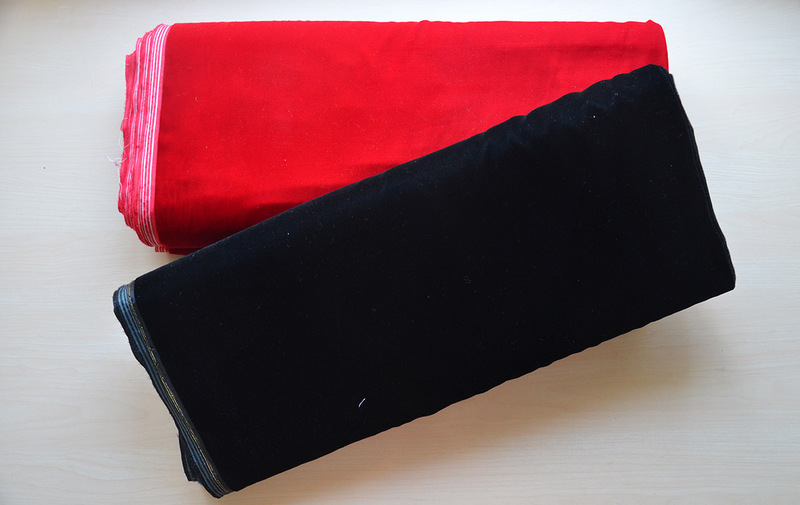 And two yards of smaller, softer, black and red ones. 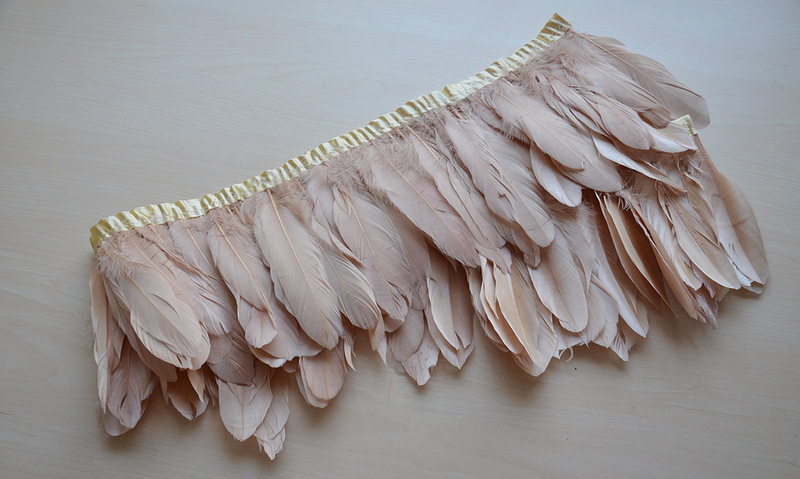 If you hadn’t guessed, both of these are for my vulture inspired dress. And that’s everything! Holy hell this was a long post. I didn’t mean for it to be this wordy. I’m passionate when it comes to talking about fabrics and trims, I guess. Speaking of that. I made a video of this haul too. I’m quite nervous in it and don’t seem as excited about what I got as I actually am. It was my first time filming myself talking and i’m hoping i’ll get better with more practice. If you are interested, it can be watched here! Amazing haul ! You’ve got beautiful fabric! I fell in love with the blue embroidered floral taffetas, it’s to die for and I already imagine how beautiful it will look turned into 18th century clothing! I do love all your work, but I can’t wait to see what you do with the dress based on the Retrato de Mujer painting. You are always challenging yourself. BTW, what a great dad to let you drag him through all those fabric stores. LOVED reading about your latest Haul. Marvelous stuff!! I especially love the blue embroidered taffeta. Boyfriend and I are planning outfits for Dragoncon in Atlanta and I want something like that for a 1700’s outfit for him!! Making dresses for my daughter and myself. Do you ever get to DragonCon? I really enjoy reading your posts. They are INSPIRING!! That is an amazing haul! 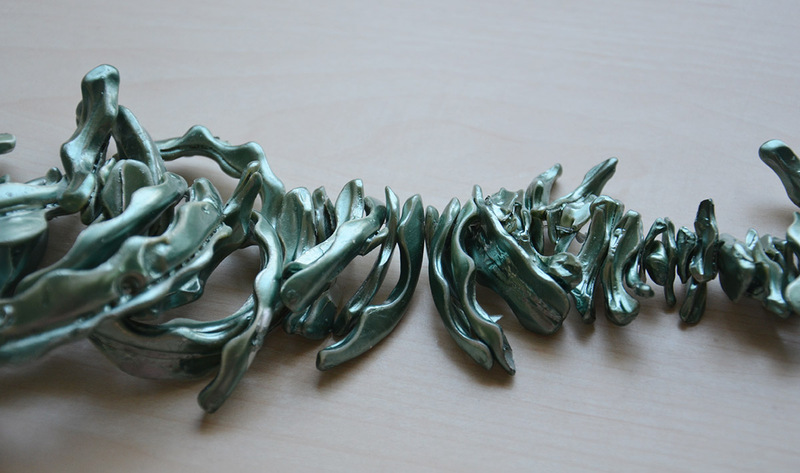 I love how inventive your projects always are, and it’s cool to see the raw materials. Loved it! Thank you so much for sharing! Just wish I could bring home so much. Have you ever heard of the show once upon a time? It has a gorgeous costume department. The clothes are a mix of fantasy and historical designs. Oh SOOO lucky!!! I am looking for fabric exactly like that blue taffeta for a Giselle from Enchanted dress. Could you tell me the maker by chance? I love that you are doing a vulture costume. I myself have a plan for a crow costume inspired by The Morrigan who is sometimes seen as a crow flying over battlefields.